Early morning sunrise and t-storm to the south. Right place, right time and a clean car!! If you look close enough, beside the drivers' side "A" pillar you will see a white circle = front antenna of Genesis radar......plus look above the dash pad...there is the Spectre RDD. hwybear wrote: Early morning sunrise and t-storm to the south. Haha bookm from Canad's Worst Driver. Oh i saw that spectre. 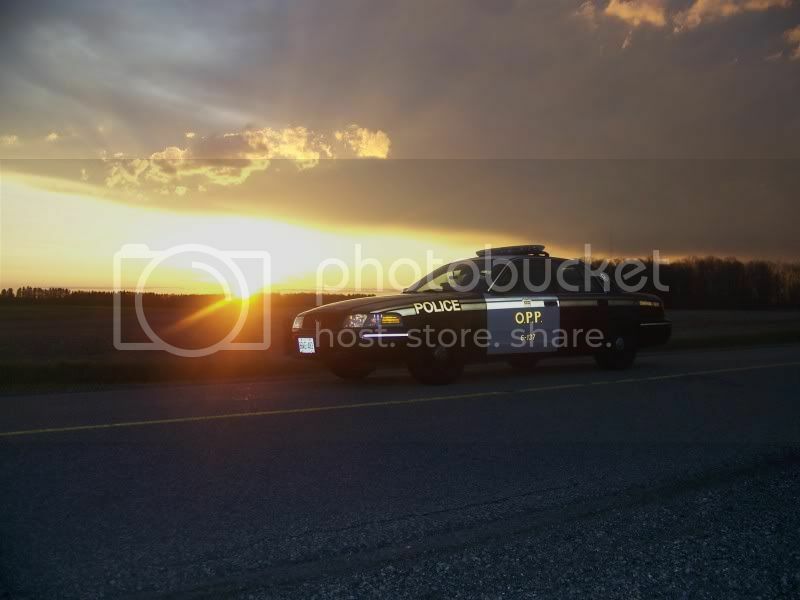 The best looking cop cars in Ontario and also the scariest sight on a 400 series highway. I must say i focus when i drive. OPP, worried about ticket, cool looking vehicle, studying the way he drives and how fast he goes, watching how the rest of the traffic reacts, and checking out the technology in the car! There is not a cooler, scarier, or more exciting time you can have on a 400 series then seeing one of those! Mind you the one time i actually do not mind driving 100 km/hr is beside one of those. hey bear do you guys got your summer tires on yet? You guys got "V" rated tires right good for 240km/hr? Do they still use the Stalker Ka radar units? I have seen them in the Tahoe i think. Genesis 2 is K band correct? How new is this crown vic, most i see around GTA region got the Genesis 2 and Spectre. Random question about your cars? Do you guys get a Radio or CD player, if you were sitting parked under a bridge doing lidar enforcement would you be allowed to listen to a CD or something? Do all cars have a GPS or GPS unit, i know those computers can look up road side history. Most police forces now, Peel and TPS have them i am sure they are wired up to the internet do you guys all got the same thing? But i do believe that if someone catches a speeder and they are exceeding 180-200 (not sure). The cop is NOT supposed to go after them and is supposed to radio down the road and mention (speeding car). Well again FireStart if you did run. Mind you once you get the plates you are done. You have a very good question. Will they deploy spike strips on a bicycle for speeding? That is nuts and almost for sure to kill or severely injure the driver of the bike. While on a car you may not kill the driver, spikes on a bike would stop it. I have seen this happen on the 407. I am sure people who drive these bikes alot know this to. One time i went under an overpass on the 407 and the guy on a bike was going pretty fast. He looked back and i guess he saw the LED's go on. He must have stalled for 3 seconds slowed down, then must have said screw it and went away. This was on the 407 to mind you. The officer did not chase i think the LEO knew he was gone. Let's say this was near the very end of a detachments patrol zone and there is not another one for a while. A guy on a bike can easily get up to well over 250. He goes a few km gets off at an exit down the road and he is never found cause they didnt get his plates and no other officers near by or available? I am sure it has happened/happens. And i am also sure this is more common on guys with bikes. Bikes can accelerate way faster, and they can go on both shoulders, and through lanes. While a big heavy crown vic might be able to accelerate fast he can not catch a 1000 cc sport bike nor drive between cars, and on the shoulders. I am not trying to be a smart alic here but i am really curious what happens when bikes try to run. I am sure when a car runs he does not get very far (even a expensive sports car) cause people would have to move out of his way and some would block him to help the police out. Also in a car putting spike strips down is not likely to kill the guy the second his tires touch them. Do you guys have less range for getting a reading on a bike with a radar and or lidar unit? Sorry my last post was really long. To make it simpler, lets say its 3 am on the 401 and you get some guy in a sport bike going 220 km/hr. It is near the end of your detachment and you know for example there is no officers in your detachment past you to get this guy and the next detachment is not for another 75 km/hr and no officers in that one are close by. Your in a crown vic you put the lights on but this guy in the bike is not going to slow down, he picks up the pace and is gone? Would you guys call in local police to block the ramps? Lets say this guy speeds up to 250 or something and goes 15 km on the hwy and gets off.? If you didnt get his plates i guess he gets away with it? The OPP have moving detachment buildings that can go 75 km/h? tdrive2 wrote: I am not trying to be a smart alic here but i am really curious what happens when bikes try to run. Friend of mine who was with the Ottawa Police spotted a bike on Innes Road several years ago, haulin' a** at night. He turned on the lights to stop him. The biker turned around, waved at him, and gunned it - gone in the distance. My friend's response? Turn the lights back off, slow back down to the speed limit, and laugh about it. I know a few guys who routinely run, mostly on liter bikes, but a few on 600's. Even met a guy who ran on a 250 and got away lol. I personally haven't done it as I make sure I don't cross the line too far, so the worst they can nail me for is a minor, which can easily be handled in court as opposed to a possible criminal charge. With that being said, ever since Bill 203 got passed, more and more people have started running even if they haven't been popping wheelies or going 50+ over the limit. It introduced an atmosphere of paranoia in the community, which isn't too surprising when you hear stories of riders being pulled over for what other riders have done. While constables who also ride (such as Bear) are out there and will not pull a guy on a Bandit because a guy on a 1000RR was observed popping wheelies, there are still ones out there that need better education. The rider community should also get involved, including those of us riding supersports and reach out to the law enforcement community. The problem is that we're what the old-school bikers used to be. An independent and rebellious bunch that's not likely to get well-organised. tdrive2 wrote: Will they deploy spike strips on a bicycle for speeding? That made me laugh so hard I drooled over my keyboard.